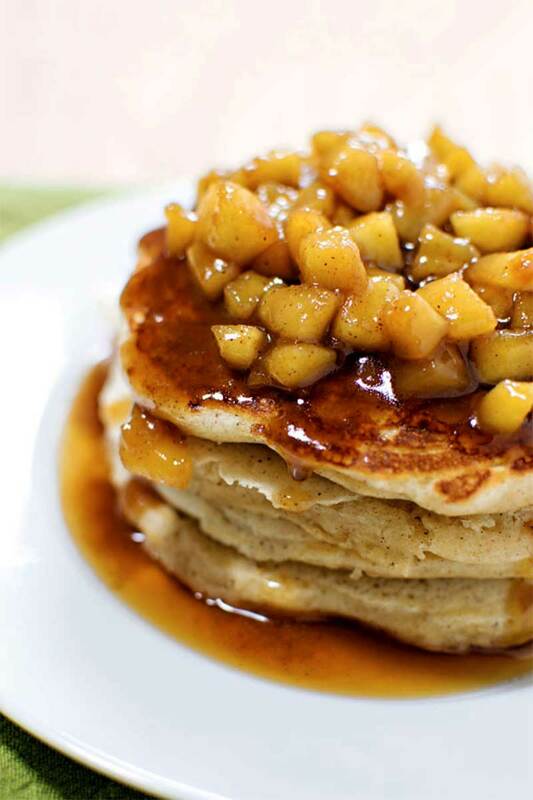 Old fashioned and fluffy cinnamon pancakes topped with fresh cuts of apple cooked in a cinnamon syrup glaze. A perfectly sweet breakfast! I’ve been trying to expand my cooking skills a little, which means looking beyond the mountains of desserts I already have on this site and rounding out my recipe repertoire. Breakfast is my probably weakest area, and I’ve already been dipping my toe in the water with recipes like Easy Vegetarian Eggs Benedict and Creme Brulee French Toast, but I still wanted more. And what says a springy, comfort-food-loving breakfast more than Pancakes? The best part is that pancakes are totally “in” right now. Everyone and their dog walker’s sister seems to be clamoring for pancakes, and that’s totally fine by me – it gives me the perfect excuse to mark another item off my cooking bucket list, since I’ve never had the opportunity to make “homestyle” pancakes from scratch before. You know, the super fluffy, thick, and doughy kind of pancakes that are ultra rich. No watery, restaurant style pancakes here! 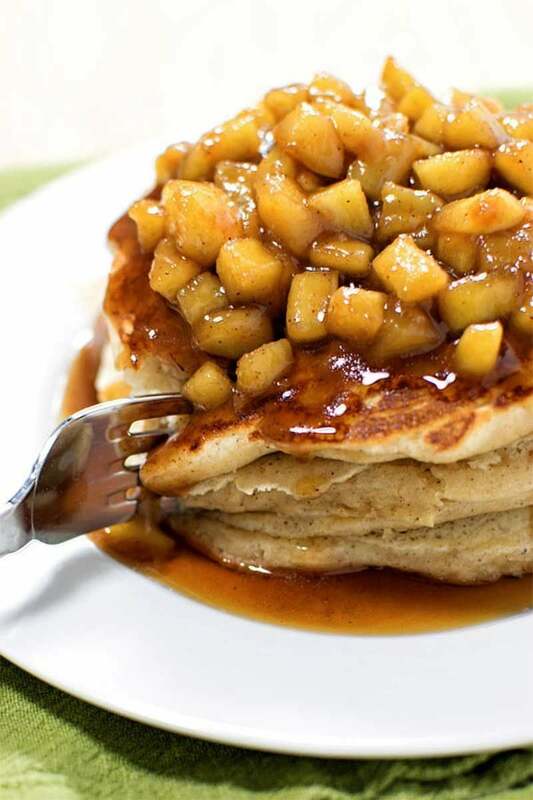 And even though I’m trying to branch out a bit from dessert recipes, these pancakes make it feel like I’m cheating, what with all those soft apple bites covered in a cinnamon syrup glaze. 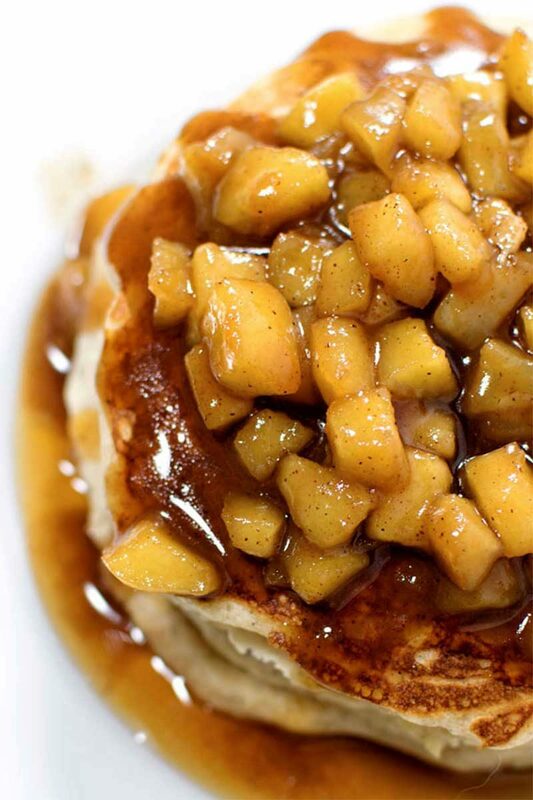 Are these apple cinnamon pancakes for breakfast, or are they actually a dessert in disguise? We may never know for sure, but I for one could have them any time of day and be perfectly content. A funny story about these pancakes: While I was cooking them, a neighbor happened to call me. I was in the house by myself at the time, so I was more than willing to invite her over to partake in the pancake taste testing with me. When I first set out to make the pancakes, I had only made a “single person” portion of the topping. I still made a full serving of the pancakes themselves, but that’s a food blogger thing – I always need to make sure I have extra batter, because extra batter means I get more tries at creating those picture-perfect pancakes. And sometimes I need to try a lot. Have you been feeling the pancake craze lately? Prepare apples by peeling, removing the core, and cutting into small pieces. In a medium saucepan, add butter, brown sugar, cinnamon, syrup, and chopped up apples. Set heat to medium and cook for 3-6 minutes or until apples are soft, stirring occasionally. You can either set the heat to low or remove saucepan from heat and cover while preparing the pancakes. In a medium mixing bowl, sift together flour, baking powder, salt, sugar, and cinnamon until thoroughly combined. Set aside. In a large bowl, whisk together milk, egg, and vanilla. Slowly pour in the cooled melted butter, vigorously whisking (so the heat of the butter does not cook the raw egg). Slowly stir the dry ingredients into the wet ingredients, forming a smooth, fluffy batter. Spray a baking sheet with cooking spray and warm over medium heat. Scoop 1/4 cup of pancake batter into the pan, then use a spatula to gently spread the batter into a flat circle (about 4-5 inches wide). Cook pancake for 2-3 minutes or until bubbles appear along the sides. Flip the pancake and cook for another 1-2 minutes until golden brown. As pancakes are ready, garnish with apple topping and serve hot. Those pancakes look so yummy. I kinda just like my pancakes plain with just syrup but seeing those pics. I am going to have to give this recipe a try very soon! Thanks for sharing! Yummy pancakes, I love the addition of apple topping! Yum! Pinned it! I didn’t realize that pancakes are in right now! 🙂 I do love pancakes and like to have breakfast for dinner! Breakfast for dinner sounds great to me! And food trends are so fickle – it’s interesting to see how they evolve over the course of the year. These look so delicious! I have to try! DELICIOUS!! Oh my word that looks and sounds amazing. My kids would go all over the place for these pancakes! Oh, I love pancakes. This would make them even better! I can’t wait to try this. i just made this recipe and I don’t see where the melted butter fits in??? Sorry about that Valerie! I’ll correct the instructions now. It goes in with the wet ingredients (milk, egg, vanilla). Thank you for letting me know! Yay! Thank you for solving my dilemma of what to make for Easter brunch. This will be perfect! Hi! Just tried this recipe, everyone around the table went silent while eating, so I guess I did something right! The mapple-apple topping was excellent! I just added a bit of sugar in the pancake mix because between the salt and the baking powder, it tasted a bit salty. Otherwise, it was great! This looks so yummy! I need to serve a large group of people. Can you make the topping ahead of time? Can I substitute maple syrup with golden syrup? Hey Sajeela! I haven’t had experience with golden syrup myself, but as long as the consistency is similar, you should be fine 🙂 If the golden syrup is a little thicker, try adding 1-2 tablespoons of water while cooking the apples. Hey Gabriela! Sorry for my tardy response, but glad to hear you liked the pancakes 😀 The melted butter is more of a cooking choice – some cooks will say it makes a difference in texture, others say not really. I like to experiment with it every now and then. The only trick with melted butter is that you have to make sure it cools enough so it doesn’t prematurely cook the egg. Hope that helps! These pancakes are sooooooooooooooooooo good ???? I’m currently making them right now and can’t stop eating them as I cook them. Hi,I wanted to know if the topping can be stored away and used when desired? Hey there! Yes, you can totally store the topping 😀 I’d recommend no more than 3 days in a sealed container in the fridge. I made these this morning, I have a dairy allergy and substituted So Delicious original coconut milk for the milk and Earth Balance Soy-Free (red box) for butter. It came out well, though I do feel like the pancakes could do with about 1/2 the salt. The apple topping was great! Made these today and they were fabulous. Will be making again. Tried this today, and it’s just perfection! I did use less maple syrup because I didn’t like it when it’s too sweet.